The Samsung Galaxy Tab S 8.4 ships in a box with the same design as its smartphone relatives. Inside it you will find the tablet, a charger and a microUSB cable, as well as some booklets. Considering the stature of the tablet in Samsung's product range, a pair of bundled headphones would have been highly appreciated. Unfortunately, the Tab S 8.4 does not follow the example set by its smartphone siblings in this regard. 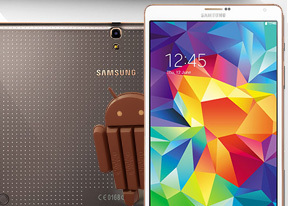 Just like most of its Galaxy smartphones and phablets, Samsung will be offering flip covers for the Galaxy Tab S series. The original cover for the Tab S 8.4, once attached, leaves almost the entire back exposed but would protect the entire front. It doubles as a stand too. Another version of the cover folds around the entire slate and doubles as a kickstand. The Samsung Galaxy Tab S 8.4 unsurprisingly features the same design as the rest of the company's tablet lineup, save for the rear finish. The latter features the same faux perforated leather-like look as the Samsung Galaxy S5, thus bringing yet another reason to justify the presence of the letter S in the tablet's name. A rather controversial part of the tablet's design has to do with the available Dazzling White and Titanium Bronze color schemes. The former features a back cover with pearl effect with gold bezel, while Titanium Bronze in real life sports a back cover in grey/brown which changes its hue under different light with, once again, gold bezel. The two colors look a tad gaudy in person - plain black with the usual chrome bezel would have been the safer, better choice it seems. The build quality of the Samsung Galaxy Tab S 8.4 is up to the company's usually high standards. The slate is superbly put together and is certain to handle heavy use without hiccups. The physical measures of Samsung Galaxy Tab S 8.4 are 212.8 x 125.6 x 6.6mm, for a weight of 294 grams. The newcomer is notably lighter and thinner than the already slender Apple iPad mini 2 (331 grams and 7.5 mm respectively). Handling the Samsung Galaxy Tab S 8.4 is a pleasure. The perforated faux leather back, despite being ridiculed by the competition, is extremely grippy. It allows users to handle the ultra-slim device without worrying much about accidental drops. The light weight of the tablet allows it to be held with one hand without causing any unnecessary strain. The Samsung Galaxy Tab S 8.4 features a gorgeous 8.4" WQXGA display with a resolution of 2560 x 1600 pixels. Its pixel density of 359ppi handily beats that of the iPad mini 2's 324ppi. Samsung took three years before fitting another Super AMOLED display in a tablet, but we are happy to tell you that the wait was well worth it. The screen of the Galaxy Tab S 8.4 is the best we've seen in a tablet by quite a margin. It is beautiful to look at with its deep blacks and saturated (if you choose that) colors. Let's look at the numbers. 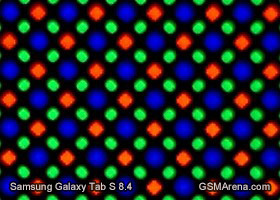 The Samsung Galaxy Tab S 8.4 has a practically unlimited contrast ratio, as individual pixels don't get lit up - AMOLEDs light up only the parts of the screen that display a different color beside black. The Super AMOLED panel on the Galaxy Tab S 8.4 isn't the brightest we've seen, it's actually inferior to the Galaxy Tab Pro slates, the Xperia Z2 Tablet and the latest iPads. However in most cases you won't notice this in practice unless you put the Tab S side by side with an iPad. The outdoor visibility is great, too. 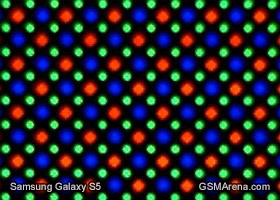 Samsung is still providing several screen color modes to match the particular needs of different user groups. They include Adaptive display, AMOLED cinema, AMOLED photo, and Basic mode. No matter which mode you choose, it's really hard to describe how impressive the 8.4" screen actually is before you see it in real life. Here goes a video comparing the newcomer's screen with the iPad Mini with Retina display. Overall, the Super AMOLED display alone makes the tablet one of the best compact offerings on the market. It really is that good.